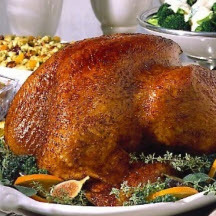 Flavorful and aromatic, a holiday-perfect whole roasted turkey with a tantalizing honey and spice glaze. Preheat oven to 325°F (160°C). Mix chili powder, garlic powder, allspice, cumin, salt, red pepper, honey and water in small bowl until well blended; set aside. Remove neck and giblets from body and neck cavities of turkey; discard or refrigerate for another use. Drain juices from turkey; dry turkey with paper towels. Turn wings back to hold neck skin against back of turkey. Place turkey, breast up, on flat roasting rack in roasting pan 2 to 3 inches deep. Brush turkey with oil. Roast turkey in the preheated oven for a total of 3 to 3 1/2 hours, covering breast and top of drumsticks loosely with foil after 2 hours to prevent overcooking of breast. Uncover turkey breast and brush turkey with honey-spice mixture when about 45 minutes of roasting time remains. Return foil to top of turkey and continue roasting until food thermometer, inserted deep in thigh, reaches 180°F (85°C).